Filtration provides clean fluids that will prevent damage to the formation, the reservoir and its permeability. It does this by removal of solids and particulates from the fluid that may otherwise block the open space within the rock formation containing the hydrocarbon fluid within the production zone. Completion fluids are specially prepared brines and generally known as drilling fluids. They are formulated for the particular job by specialized chemical manufacturers and comprise chlorides and bromides. The completion fluid should be chemically compatible with the reservoir formation. Matching the density, flow and pH content to the unique characteristics of the well will improve the performance of the well production zone. Any solids and contaminates in the completion fluid will reduce its effectiveness. An efficiently filtered and completely solid free completion fluid will add value to both the productivity and the dependability of the well in the long term. • during the use of any new mixed brines. Clean completion fluids and brines are required for effective completion and maximum oil and gas production. They contribute to overall productivity. 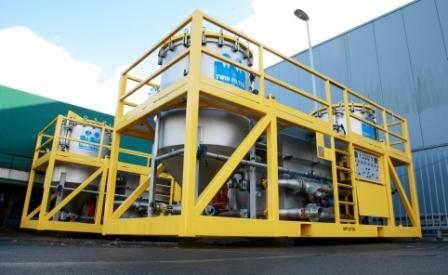 Cleaning of completion fluids can be carried out with either a Filter Press (FP) or a Vertical Pressure Leaf Filter (VPL) both in combination with Duplex Cartridge Filters used for the final polishing of the fluid. Well designed, manufactured and installed closed loop Vertical Pressure Leaf Filters perform better than filter press systems of the same size and are safe to use and more friendly to the environment than competitive systems. Their operational success is derived from using an experience provider of well designed and engineered equipment capable of providing technical backup and support as well as using well trained operators.